EAST GREENSBORO, N.C. – North Carolina Agricultural and Technical State University has named Mohamed Ahmedna, Ph.D., a renowned researcher and a N.C. A&T faculty member between 2000 and 2010, dean of the College of Agriculture and Environmental Sciences, effective Oct. 1. Ahmedna is currently a fellow with the American Association for the Advancement of Science at USDA’s National Institute of Food and Agriculture in Washington. He also was a professor of food science and nutrition at Qatar University, where he served as associate dean for research and graduate studies in the College of Arts and Sciences, 2010-2016. During his previous time at A&T, he served as founding director of the university’s Center for Excellence in Post-Harvest Technologies, part of the North Carolina Research Campus in Kannapolis, 2006-2010. Prior to that post, he moved through the faculty ranks as an assistant, associate and full professor in the Food Science and Nutrition Program in the Department of Family and Consumer Sciences. As principal investigator or co-principal investigator, Ahmedna has received $26 million in competitive research grants and authored more than 200 publications and presentations over the course of his career. His research focuses on value-added product development with an emphasis on functional foods and bioactive compounds, as well as lifestyle interventions for health promotion and chronic disease prevention. 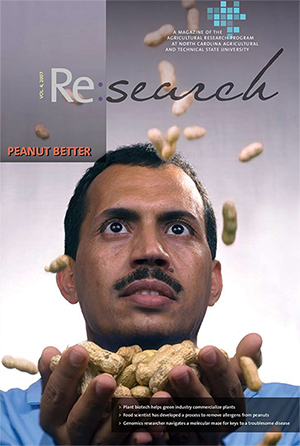 He earned a patent for a process to reduce allergens in peanuts and filed three other patent applications. His research has been covered by major national and international media outlets. His research awards include the Thurgood Marshall Fund’s Distinguished Faculty Member Award, A&T’s Outstanding Senior Researcher Award and the United States Agency for International Development’s George Washington Carver Agricultural Excellence Award. He has taught undergraduate and graduate courses in research methods, as well as graduate courses in sensory evaluation, food preservation and food product development. He has served as the primary advisor for 16 master’s students and two Ph.D. students. Ahmedna holds a bachelor’s degree in fisheries and ocean engineering from the Institut Agronomique et Veterinaire Hassan II. He has earned three master’s degrees: one in food science from Louisiana State University (LSU), one in applied statistics from LSU and one in business administration from the University of North Carolina at Chapel Hill. He received his doctorate in food science from LSU. A&T’s College of Agriculture and Environmental Sciences includes four academic departments: the Department of Agribusiness, Applied Economics and Agriscience Education; the Department of Animal Sciences; the Department of Family and Consumer Sciences; and the Department of Natural Resources and Environmental Design. Through its Agricultural Research Program and Cooperative Extension Program, the college researches issues of importance to North Carolina and provides research-based outreach training across the state and around the world.